High cheekbones are considered a must have and the most sough after facial accessory today. They give the face an immediate youthful appearance and enhance the shape of the face. Unfortunately, as we age, the skin loses its elasticity, the fat is getting depleted and repositioned as the gravity takes over while our bones are getting thinner and hence we are left with sunken cheeks and an exhausted looking face. By restoring the natural youthful curve of the cheek bone, not only do we look instantly younger, we also look refreshed as the lower eye puffy area gets rejuvenated as a bonus! Both men and women have this issue and both can be treated, but it’s a matter of finding an experienced physician who understands facial anatomy as well as facial aesthetics that will not result in male feminization or female musculization. 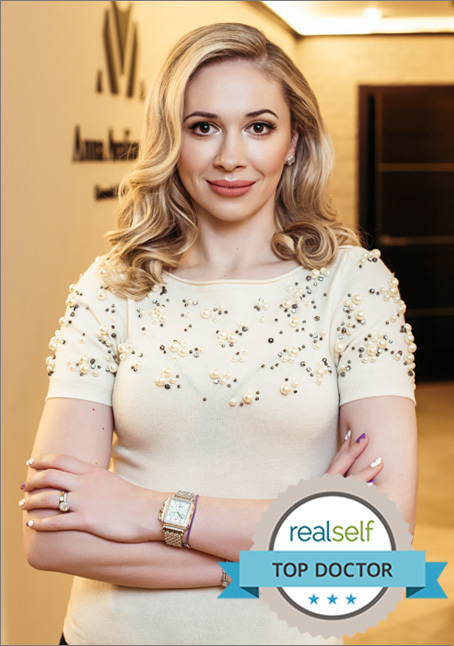 Dr. Avaliani is an expert in her field and understands both female and male facial anatomy and is striving for the most natural and elegant results possible. There are multiple options on the market ranging from permanent like cheek implants or silicon injections to semi permanent and reversible results with fillers. If you are looking for natural results with no downtime and virtually no side effects, your best options are HA fillers such as: Restylane® Lyft, Juvederm® Ultra Plus or Juvederm Voluma®. All of the treatments offered by Dr. Avaliani are FDA approved. All HA fillers are completely reversible. They differ in their viscocity and lifting ability. They range from thinnest filler like Restylane® Silk to the thickest Juvederm® Voluma. During your consultation Dr. Avaliani will determine which option works best for you. Fat grafting is autologous fat filler, which is obtained during liposuction procedure, where the fat is taken from one body site that has an excess fat tissue, and placed in another one, that is deficient, like the face, breast or buttock. There are virtually no side effects and no reactions as this is a natural body substance and the results are permanent and lifelong. Radiesse® is an injectable filler composed of Calcium Hydroxylapatite (CaHA) microspheres suspended in a gel. CaHA is a mineral found naturally in bones and teeth. Over time, the microspheres stimulate the body to produce its own collagen, the gel is absorbed and the microspheres are broken down naturally, leaving behind only the newly formed collagen. The results last from 18-24 months, the product is irreversible and is prone to developing bumps under the skin, which can be managed by an experienced physician. Sculptra® aesthetic dermal filler made out of poly-L-lactic acid. It stimulates collagen production and is considered long lasting, with results that last as long as 2 years. It is often used to treat areas that are collagen and fat deficient: such as hollow temples, smile lines, sunken cheeks, or defined jaw line. What treatments does Dr.Avaliani offer?